As you attend various classes to learn new techniques and skills for your quilting projects, a portable pressing mat can come in very handy to have close to you as you take a class. They are easy to take along to class each week, guild meetings, retreats or a sewing date with a friend. A portable pressing mat does not have to be large, thus “portable” is the concept here. You just need a surface large enough to press blocks or to lay out a fat quarter, precut Layer Cake square (10 x 10″) or spread out a small amount of fabric on top for a quick pressing. Make it whatever size you want! How do you make your own portable pressing mat? 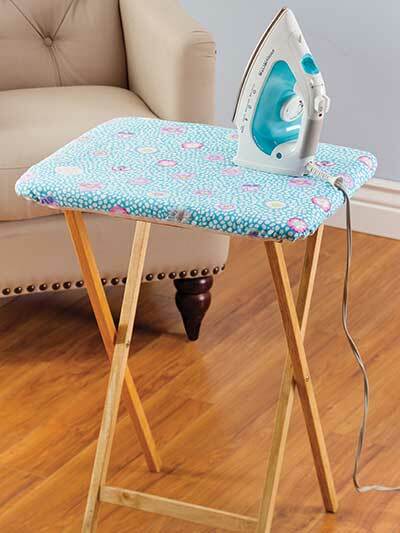 Well, my own came from a cast-off small portable ironing board I found at a garage sale. I ended up recovering it by first pulling off the previous covering and then layering up batting and insulation before recovering with a cotton denim-like fabric. Other ideas are to make your own mat with layers of flannel, batting and a product called Solari which we sell at Hamels. 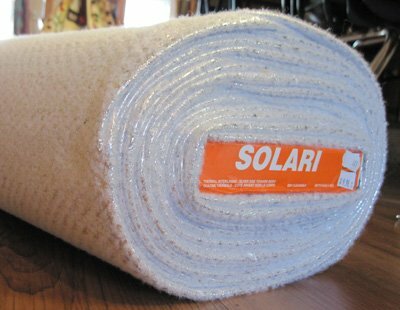 Solari is a 100% polyester batting used primarily for lining the insides of oven mitts and hot pads or any item needing a protective heat layer. The outside of the product is silver coated with a heat resistant surface. It is 60″ wide. Layer Solari with batting and a layer or two of flannel and you have a pressing surface fit for your next quilt piecing project. An old towel is another suggested item for “padding” underneath your pretty fabric covering your pressing mat. You basically want to built up enough thickness so that your hot iron won’t damage anything you press against. You can create your mat to be just to sit on a table top and roll up afterwards or you can go a bit more elaborate. 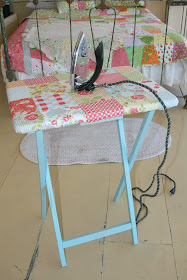 Recently, I have heard of quilters converting old “TV trays” also know as portable folding tables into a pressing station. What a great idea! Take a look at these pictures. Hope this post inspires you to see what you can create for your pressing needs. Happy stitching!